I’ve made the same observation/prediction for Florida as it’s well known for being a pipeline for NY and New England residents. I’m originally from the Tampa Bay area and have witnessed their political attitudes being put into effect as transplants began to take office, which usually begins at the local level. It’s no wonder the metro centers are blue while rural FL is red (mirroring the country). Hillsborough Co just implemented a sales tax increase while the state raised minimum wages above the Fed rate. I think FL will be the next California, which makes me very sad to think about if I were to return, and may affect my decision to do so. The problem we have here in Texas, is that they vote with their feet, and then come here after they’ve ruined one state, and bring their voting patterns with them. Why don’t they just stay where they are and fight to make it better (similar argument I have about illegal aliens) I mean, these people have shown themselves to have extremely advanced protesting skills- shouldn’t they stick around where they are and use them? This dynamic also works with migration from 3rd world socialist crap holes to 1st world socialist crap holes. This is the #1 reason that I oppose migration, or at least 90% of it. The primitive savages who live in 3rd world socialist crap holes like Mexico come to 1st world socialist crap holes like California and vote for more socialism, because they are ignorant and stupid and have no idea about the truth about why California used to seem like a better place to be than Mexico. As a Californian the last thing I want is more ignorant socialist savages coming here to vote to give more power to the ignorant socialist savages who already have enough power here to destroy us. And if I were a non-California state of the Union I would build a wall to keep Californians the hell out. 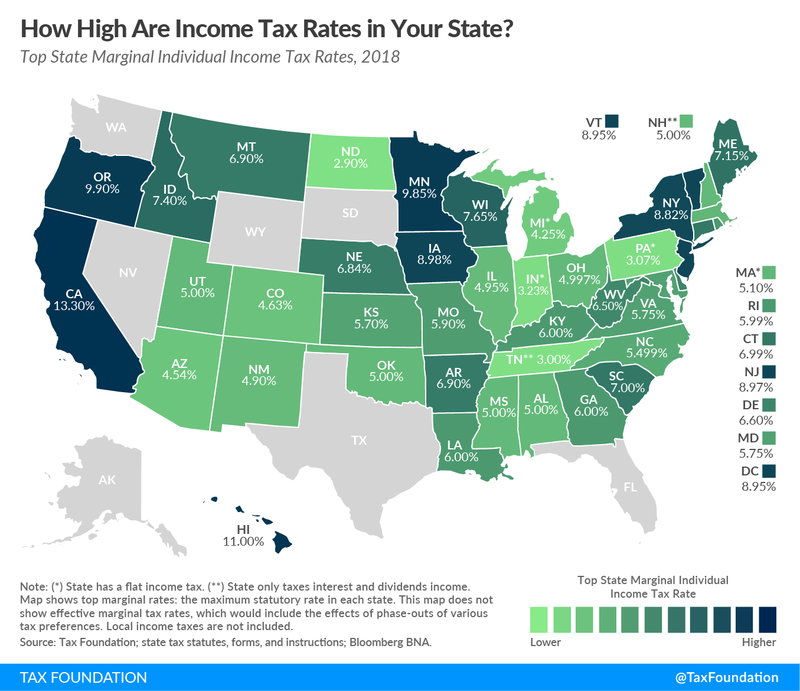 The Tax Foundation’s map gets it right, as far as it goes, and shows the seven states that have no personal income tax (though Texas, at least, does tax corporations). But it would be nice to have one like it that shows the combined picture with other taxes; most states without an income tax have high sales or property taxes. An ideal situation, from the tax migrant’s point of view, would be to live near a state line you can take advantage of. For example, Oregon has no sales tax, so the migrant might want to live and work just over the state line in NV or WA and buy all his groceries in Oregon.